The meatballs steamed, cooked in a slow cooker, is a great diet dish that is suitable for adults and for children. Steam cutlets prepare from the meat or chicken, fish and even mushrooms. At the same time with the main dish in a slow cooker, you can make a side dish, such as cooked potatoes. Prepare the following ingredients: 0,5 kg of meat (beef, pork) or the beef, 2 onions, white bread (palatana), breadcrumbs, 2 eggs, a little milk, salt, spices to taste. Soak in mixture of milk and water bread. Meat cut into pieces, pass it through a meat grinder, then turn the onion and soaked bread. Add into the mixture eggs, salt and spices, mix everything carefully. To burgers turned out juicy, add a little minced boiled water. The lightness will give the dish added to the mince a small piece of butter. 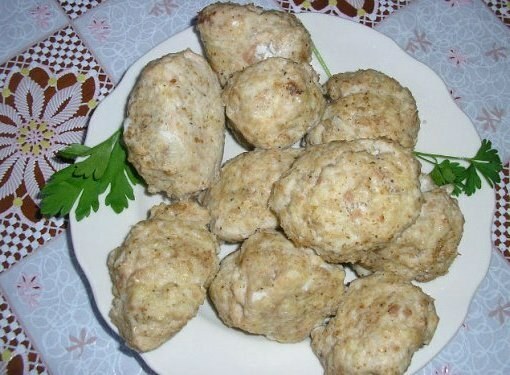 Form of minced meat small cutlets and roll them in breadcrumbs. Pour into the slow cooker 1 Cup filtered water, insert shape for roasting, put in her burgers. On average, in the form removed 8 pieces. If the portions were a lot, cook them in several batches. Set the mode "Steaming" (or "steaming") and the cooking time is 35 minutes. Serve finished meat steam cutlets hot with a salad of fresh vegetables. Garnish the dish with finely chopped greens. To cook in slow cooker fish cakes for a few, take 600 grams of fillet of any marine fish, 1 egg, onion, 4 tablespoons of bran, dill, salt, pepper. Grind with a blender the fish fillets, add the chopped onion and remaining ingredients, mix everything carefully and leave for 20 minutes to bran swollen. Form burgers. Pour water into slow cooker put chops in shape for the pair, select the mode "Steaming" and the cooking time is 30 minutes. Steam fish cutlets can be served hot, and cold. They can make a delicious white sauce. Try to cook in the slow cooker mushroom meatballs for a couple. Prepare 800 g of mushrooms, 1 Cup buckwheat, 5 tbsp. oatmeal, 1 egg, 1-2 onions, sunflower oil, salt, pepper. Clean the mushrooms, slice them and boil in salted water until tender. Rinse the buckwheat and pour it with water. Cook it in the bowl multivarki in the "Groats". Cooked mushrooms drain in a colander, then grind with a meat grinder or blender. Slice the onion into cubes and sauté it for 4-5 minutes in multivarka mode "Frying". Add the mushrooms to the onions. Fry for another 5-7 minutes, stirring occasionally. Put in mushrooms, buckwheat, egg, add salt and pepper, stir in cereal. The ratio of mushrooms, buckwheat and oatmeal cutlets can be changed at their discretion. Form small patties and place them in a form for roasting. Pour into the bowl multivarki 1 Cup of water. Cook mushroom cutlets for 15 minutes in the mode "Steaming". To prepare the side dish (e.g., potatoes) at the same time, steam meatballs, put the meatballs in a container multivarki for cooking for a couple. Wash and rinse the potatoes, cut into not very large, put in a bowl multivarki, the sunflower, season with spices, pour water so that it almost completely covers the potatoes. Place potatoes over the bowl of a double boiler with meatballs. Install on multivarka mode "Cakes" and cooking time - 40-45 min With the finished potatoes drain the water and prepare the mashed potatoes.